The founder of Buddhism in this world was Buddha Shakyamuni who lived and taught in India some 2,500 years ago. Since then millions of people around the world have followed the pure spiritual path he revealed. He taught methods for gradually overcoming minds such as anger, jealousy and ignorance, and developing positive minds such as love, compassion and wisdom. Through this we will come to experience lasting peace and happiness. These methods work for anyone, in any country, of any age. Once we have gained experience of them ourselves we can pass them on to others so they can enjoy the same benefits. 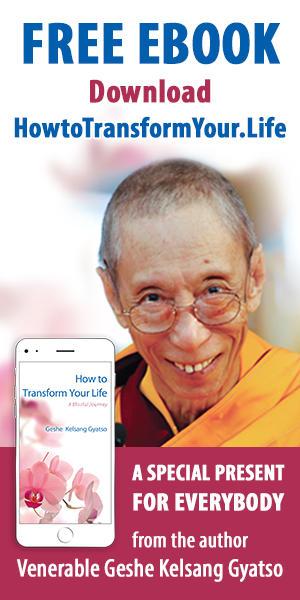 Geshe-la has worked tirelessly to spread Kadampa Buddhism throughout the world by giving extensive teachings, writing many books on Kadampa Buddhism, establishing the International Temples Project and founding the New Kadampa Tradition – International Kadampa Buddhist Union. Click ‘Like’ to Follow on Facebook!